Pure Evoke D2 review | What Hi-Fi? 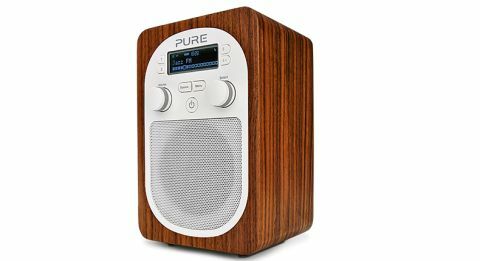 Pure is a radio specialist, and that shows in the Evoke D2. This is a bargain of a radio at £85, though we’d consider investing in a ChargePak as well (£28 extra) – that would make the radio really portable for al fresco listening. This is a nicely put together unit, a solid box with an expensive-looking wood-veneer finish. Pull up its telescopic aerial, plug it into the mains and it will start to auto-tune to all available stations. The tuners are effective, finding most stations without fuss, and then sticking to them with a cast-iron grasp. There are 20 presets available, 10 each for FM and DAB. Three are easily accessible via the buttons numbered one to three alongside the display; the other seven once you have pressed the ‘4+’ button and then chosen via the select knob. Not as quick a method as some, perhaps, but perfectly intuitive once you get used to it – and it keeps fascia clutter down. As well as the radio tuners, the Evoke D2 has an auxiliary input for an external source, and an alarm with a variety of functions and a sleep timer. Once we’ve waited a short time for the auto-tune function to do its thing we get straight down to listening. And the unit sounds excellent for a sub-£100 radio. It’s incredibly detailed, excelling with voices and allowing rich mid-tones to come to the fore. It doesn’t overdo it, though, so it still allows music to flourish while not flattening out the frequency range too much. Indeed, it is an even-handed sound without undue prominence to any part of the audio spectrum. Bass is fast and taut without being overbearing or too prominent, and higher notes ring clear without ever becoming strident at higher volumes. On which note, it must be said that this radio doesn’t go quite as loud as some rivals. It’s perfectly fine for normal listening in the bedroom or kitchen, but don’t expect it to fill a large busy room with sound. The display does its job very serviceably. If we’re being very picky – and this is such a good unit that we feel we can – it seems a little old-fashioned now, with the scrolling text blurring somewhat as it moves along. As we say, though, that’s a minor quibble when the rest of the performance is as good as this. For less than £100, this is a very fine product. While the ChargePak would bring it over the magic ton, it’s a worthwhile investment, we feel, allowing the obvious benefits of listening outside or anywhere around the house that untethering brings. It sounds balanced and easy to listen to with a wide range of programming and whether over FM, DAB or via the aux input. It earns, therefore, a very easy recommendation from us.